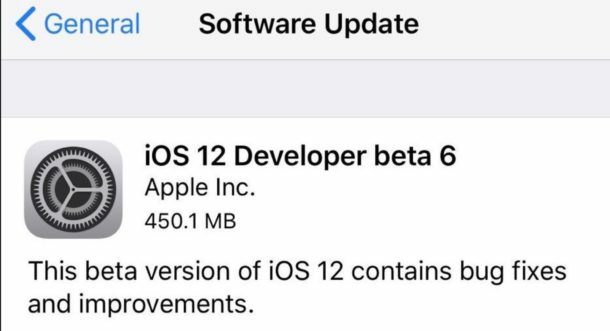 Apple has released iOS 12 beta 6 and macOS Mojave beta 6 for users enrolled in the developer beta testing programs. Additionally, beta 6 of watchOS 5 and tvOS 12 are available for users testing those releases. Typically the accompanying public beta release comes soon after and is versioned a release behind but is otherwise the same, so public beta users should also periodically check for the software update. Thus, while the developer beta is versioned 6, the accompanying public beta would be versioned as 5. Mac users can find the latest macOS Mojave beta 6 update available now from the “Software Update” section of “System Preferences”, as the OS update mechanism is no longer contained within the Mac App Store. iOS users can find iOS 12 beta 6 available to download now from the Settings app. Technically anyone can install the developer betas of macOS or iOS if they come across the beta profiles or installers, but the developer builds are intended specifically for developers. If you’re curious about running a beta operating system, a much better idea is to install the iOS 12 public beta or install the macOS Mojave public beta. MacOS Mojave includes an all new Dark Mode theme, new Dynamic Wallpaper feature which changes the background picture throughout the day, a new Stacks feature for the Mac Desktop, multiple new Finder features that allow for improved file browsing, a new feature which allows you to import photos and scans from an iPhone or iPad to a Mac, along with many other smaller features and refinements. iOS 12 is said to focus mostly on performance, but also includes new features like group FaceTime chat, a new “Memoji” feature which lets you create an animated avatar, a Shortcuts feature that replaces the “Workflow” app and which can be activated with Siri commands, an all new Screen Time feature which keeps track of how long you use particular apps and app categories and allows you to set app usage time limits, along with many other small features and changes to the iOS operating system. Apple has said that macOS Mojave will be released in the fall, as will iOS 12. Three issues that I am having with the Mojave Beta. 1. On Safari the mail icon isn’t working. This icon is when you want to send somebody a link via mail. 2. Mail is disappearing from the inbox and reappearing. 3. iMessage is running slow and messages are out of order. The pros to Mojave is that the dark mode is beyond awesome! Messages are out of order on my High Sierra 10.13.6. It is most probably not a Mojave beta issue.